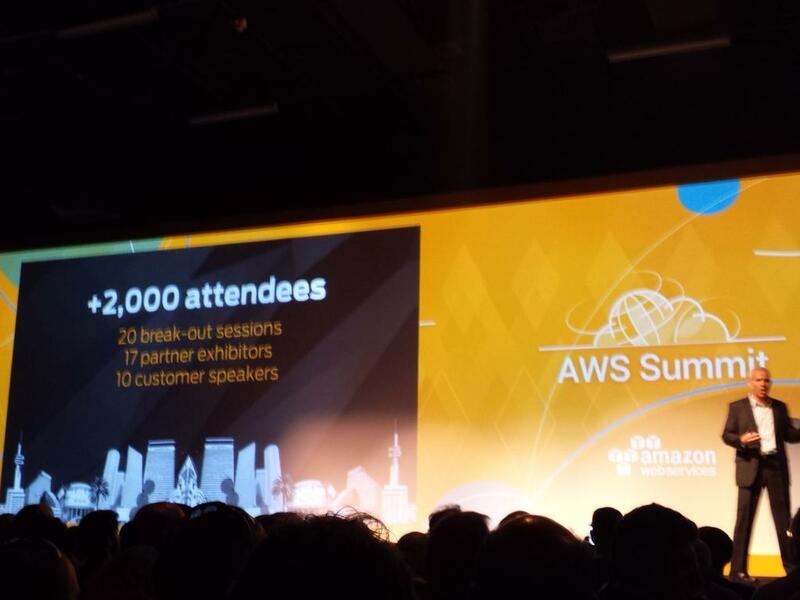 I attended the Amazon AWS Summit event in Tel Aviv the other day and it was a very impressive roadshow event. How many roadshow events gather over 2,000 people to them in your country? This being a startup capital not surprising to see so many people in attendance. 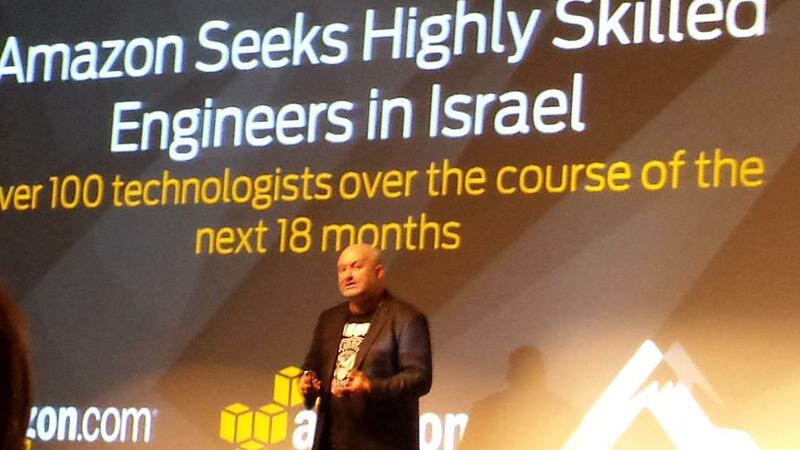 There was a 2 hour keynote given by Werner Vogels, Amazon CTO and the local Israel Territory Manager Harel Ifhar. Werner has been here a few times, this is not your typical CTO, hard not to like a guy that wears a suit with a Ramones T-Shirt and says they need to hire more techies over the next year and a half. And then changed his shirt to a Rage Against the Machine one later on. My favorite lines from Werner, "Friends don't let friends build data centers", "Hybrid IT is part of the Journey, NOT the Destination" and "Fighting Cloud is like fighting Gravity". The overall message was sales and growth(102% and 93% growth of EC2 YoY and there are over 1 million active users), features (516 new major features and services added to AWS in 2014) and 2 or 3 new bits added to the AWS stable. AWS Elastic File System was one of the main new offerings and another was machine language is picking up interest and AWS has offerings in that space now too. We also heard from 4 companies using AWS. Glide, Yes, Comverse and the gaming company Gamefly. Gamefly, during his testimonial, had a live game playing on screen, sounds and all to prove how well AWS handles streaming and live gaming. I felt it took away from his speaking as everyone was mesmerized, but hard to deny the proof was in front of us that the AWS cloud provides some great efficiencies. Also saw a few friends there unexpectedly, and an AWS Architect I know that was speaking later in the day who I happen to see a year and half ago when I was visiting and spent a day at eBay hearing about their Hadoop architecture. It is odd to go to event as an attendee and think, "so that is what it is like when I am working and doing my sessions". Nice to see it from the other side for a change. Are we all usually so rushed? I apologize to anyone I may have passed and not caught up with again, but you usually find me after hours and I always have time after my session. In the exhibition hall were about a dozen or so AWS partners plus an Amazon station where you could get technical help, learn about the user groups, ask about the 100+ jobs on offer and also get certification. A mix of document management, log/monitoring and education/support companies were on hand to help everyone get more from their part of the AWS cloud. A REALLY nice thing Amazon did was they had one color, bright orange, for their technical teams that were there to help everyone. Made it very easy to find them. Business AWS people wore a more common black, but at least you knew the sales people when you saw them. 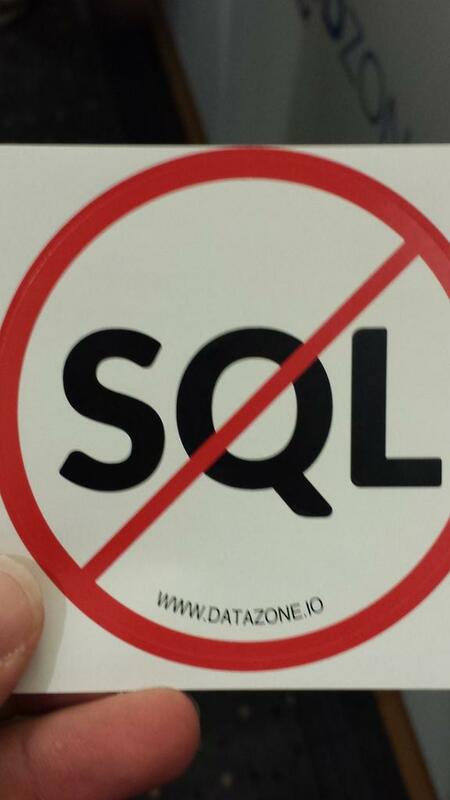 What you all want to know about was the swag, and aside from some devops t-shirts, there were many stickers. Laptop tattoos as you might call them. 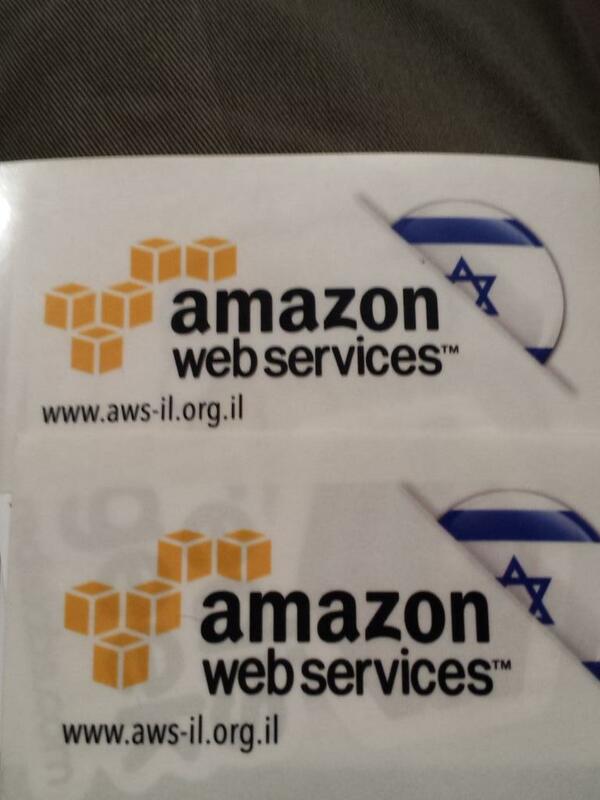 Some favorites were the No SQL one, the beer mug and the AWS Israel one. 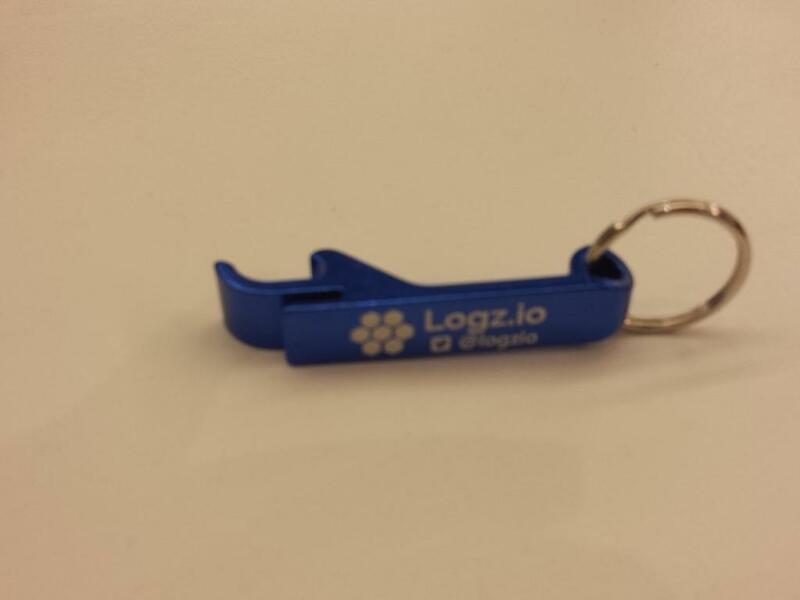 And logz.io won me over by having keychains with bottle openers. I'm easy to please. A stress ball and a beach paddle game were also given out. But I was not there to use anyone's services so I was happy with my laptop stickers. Amazing food awaited everyone for breakfast and lunch, candy, snacks, drinks, popsicles and beer. I did not wait in line for the beer, VERY long line, as you can imagine. I realized afterwards, having been to so many conferences over the last 2 decades, I almost never have been able to eat the food and realize just how well everyone else has been eating. Nice to get fresh kosher food at a conference, another benefit of living here in Israel. Unfortunately I did not get to stay all day for the tech tracks int he afternoon due to previous work requirements. If you get the chance to catch the AWS Summit in your city you should go and experience it. Maybe they are, maybe they aren't. The better ones pack their blogs early for that flight into the stratosphere. Hubspot as an example plans for a methodical path and even break out their blogging into 4 or more parts! Groupon started out as a blog and became the app/platform that is now common. Blogs can be powerful, but they can also be an albatross. The power lies in the long term view of indexed information about your company or business. The more you put into the SEO and links and unique search terms for your business, the easier you will be found. And your blogs live forever, or at least as long as you keep them online. The albatross which people don't think about upfront is the "I need to write a blog post now/today" nagging in their head. So many more important things to do, it will wait. NO, it won't! But one day rolls into two and then three. Before you know it, a week has passed, and then another, and your blog is like a ghost town. Where will your magical viral audience come from...if no one ever hears about you? There a tons of reasons not to do it, few of which have any merit. Why should you be blogging and telling your story, in your words? The difference between manual actions and automated ones is not obvious to people. You love your app, but no one uses the best part (in your eyes). You built the app for teachers, yet corporate HR is using it more than teachers. If people like what you are doing, they will read your posts (blog, newsletter, email, tweet) and give you feedback. You want PR, you need customers, you want people to find you and love you....but you never write, you never care, you just sit there and wait for them to come to you. Never going to happen. Stop Tweeting, and Facebooking, and just get writing. information, ideas, details, actions, and presuming everyone does the same in return so you truly reach that 1+1=3 world. I am spending sometime on a side project with a company that is leveraging O365. On the outside looking in, it seems to be just what one wants for work. Online shared space for files, email, IM, ESN(Enterprise Social Network), team/group space, Office tools, and much more all wrapped up in one price and available only in the Cloud. The first thing I experienced, and keep in mind I am accustomed to being the admin usually, was my name was spelled incorrectly. In general, not the end of the world, however, in some cases, my logins were correct, but it appears not in AD. When I asked IT to correct it, they told me it would take most of a day to do this because they would now have to go change all the other systems that I have logins for and fix them as well. SSO is not available in O365? And to rename an ID takes hours? As an admin, I am bemused at the discussions. Normal users probably just shrug it off as IT time and plans. My login aside, the quirks of O365, as some of my friends call them, are more a skewed view based on other products and our own expectations. It seems one can not change the colors on screen for Outlook (2010 edition they use here). The choice is limited to 3 colors, none of which are even remotely exciting, Blue, Silver, Black. Cowboys and Raiders colors? What about us Dolphin fans that want orange or green? Or just set to Windows Desktop theme colors? Evidently 2013 is no better about this. I will post this next bit, as it is important, but want to point out it is not unique to Microsoft. The multiple profiles, pictures, details issue is a major PITA to employees. Why can't the entry in AD cover the basics of the person (name, photo, phone, location, email, etc..) and have that, via LDAP, or AD itself, pushed out to any other system connected to it for user accounts? Instead there is Outlook, SharePoint, Yammer, and whatever the O365 bit itself is called all not sharing ANY details, in the case here, not even my login and password for the domain. Yes, WTF indeed. When signing up to Yammer can you please add a recognisable photo of yourself, so people can easily identify you in the office. Also add your phone number(s) and where you are located, including which floor you are on. As it turns out SharePoint is not connected to O365 here, so I understand that...as an IT person. As an employee it would make me wonder why, if I cared enough, which maybe no one does anymore. Thus why adoption of an ESN is not an easy task inside companies and why I try to help it best I can. Before some friends jump on this, as some have, be careful, IBM in this case does not handle it any better. Sametime vs. Connections profiles/photos vs. Domino data/profile/photos. Same problem, no solution. I understand why, in both companies products this exists. Simply put, if they have no way to know what "solution" you are installing, they have no way to provide the details efficiently. My argument has always been it should reside in the Directory (AD, Domino, whatever) and let everything else pull it from there. Whatever, live with it, do not slam either for this shortcoming. The login and password thing is more bewildering to me. My Windows Domain login and password do not match my Outlook or Yammer ones but does SharePoint. A hybrid model that works as designed I guess but SSO or SPNEGO or even Oauth, anything/something would be a better solution. On the plus side, the Yammer mobile client looks good and works well albeit in a multi step process just to message someone. I wait for the "Skype will rule it all" day coming soon, but for now, tick the box, they did mobile. You need to flip back and forth to the option menu to read group messages or the "stream" and to message someone takes 4 steps but it is a simple UI and easy to respond to posts in the stream or groups. Yammer desktop, in short, does not exist. This is a frustrating thing for someone like myself so used to just sending IMs easily for the last 17+ years from a list in my tray. While one gets notified when there is a message, if you want to send someone a message you have to login (or keep a browser window open) just to then get to your list and try to message the person. I say try because I have not found a way for the web client to sort people by online status or even by alphabetical order. The Skype transition/integration can not come fast enough in my opinion. Yammer Desktop Notifier is mostly a waste of time since it does NOTHING. To be fair, it has 3 options, (Inbox, Notifications, My feed) that when clicked take you to a browser and the messages. And if something is waiting for you, it has color codes to let you know in the little icon in your tray. But lookup people? Send an IM? No and No. In a corporate desktop world, this is frustrating. In a mobile, non desktop world, this is fine presumably, I have not loaded it yet on my iPad so I have no direct knowledge at this time. The discussion around dropping SharePoint in favor of Jira is a conversation which I have not gotten into previously but would seem to be a major question/issue for companies that are using SharePoint or any ESN as a project management workflow tool. I may write more on this in a future blog after some further research. Overall I can't say anything has blown me away that I must have it, aside from Skype. Perhaps Microsoft and other companies providing Enterprise solutions now find themselves in an unusual situation, big ugly/heavy clients that we use 10% of the benefits have passed their sale dates. When you really have better apps on your phone than your office, we are no longer on the "when will we get updates" discussion, but on the "why can't we use this app" or just doing it anyway. This is not a new opinion, we have been discussing it for years, but as I saw first hand, when IT people and executives are no longer willing to adjust to employees needs, then we in IT have failed and it matters little which vendor you chose.